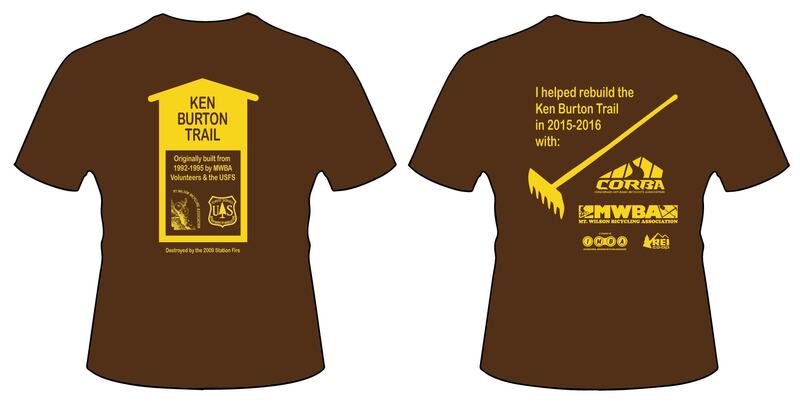 On Thursday, March 3, CORBA and MWBA Volunteer Sawyers and some additional dedicated volunteers continued work on the Ken Burton trail. This time they started at the bottom of the trail, from its junction with the Gabrielino National Recreation Trail, working up the lower switchbacks through a tangle of downed trees, poison oak, overgrowth, and near-impossible wayfinding. Using chainsaws was the only viable means of cutting through the several fallen oak trees that once shaded this beautiful old oak grove. This shaded oak grove was often a popular spot to re-group after challenging oneself to clean all the switchbacks, before attempting the most difficult between there and the Gabrielino trail. Steve Messer had spent February 20 flagging out the original trail, using a combination of GPS tracks, searching for ground evidence of dirt compaction that may still be found even after six years, and a good memory of one of his favorite trail loops. The group made what appeared an impossible task look relatively easy, working carefully to cut brush, downed trees, and have swampers carry away and stash the cuttings. It was most gratifying to follow the string of ribbons, and find the original tread under all that brush and debris. We made it to the 17th switchback, our target for the day. 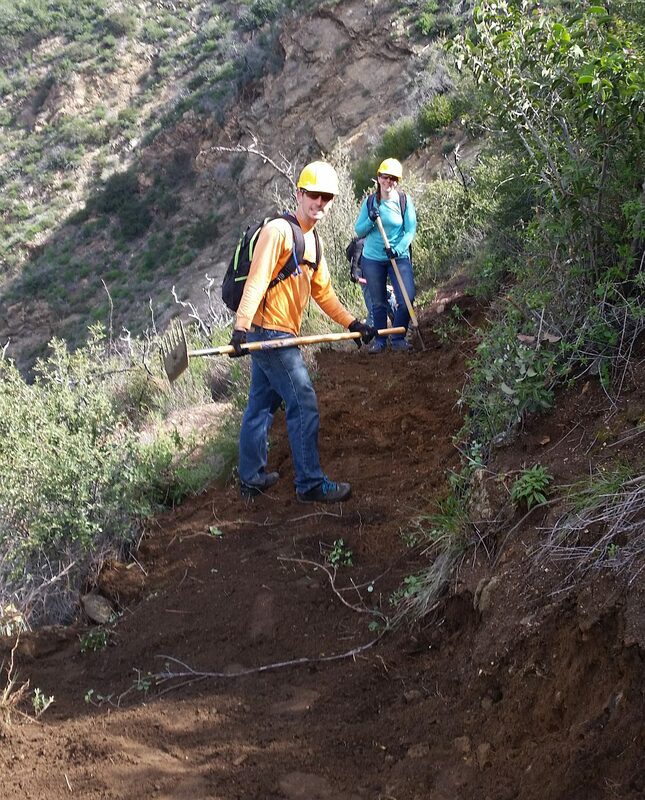 Ten days later, on Sunday, March 13, 2016, was our 13th group trailwork day. It was especially encouraging to see that all our previous work has held up perfectly to the recent rain and storms, with no rutting, and soil being packed down nicely. The first sections we worked on last November are maturing nicely. Our 13th worday on Sunday March 13, was a milestone day. With 21 volunteers out putting in a 7 hours or more, we were able to do a first-pass brushing on the last remaining section of trail, linking to our March 3rd work and to the bottom of the trail. This was a great milestone in this restoration project, now in its sixth month. We had cut brush from the entire trail corridor. While the brushing tools and swampers diligently plugged away to reopen the trail corridor, the tread crew made quick work of the tread on about .3 miles of trail. With the damp dirt, cool temperatures, and sense of determination among the volunteers–many of whom have worked multiple days on this project–we had an extremely productive day. There is still work to do on the 16th switchback, but it was rendered temporarily passable for the day. The last half mile of the trail is far from finished, needing a second pass with the hedge trimmers and extensive treadwork. But with some careful hike a bike the group was able to ride out the bottom of the trail, completing the loop with the closed Gabrielino trail. It was a truly gratifying day for all who made it. 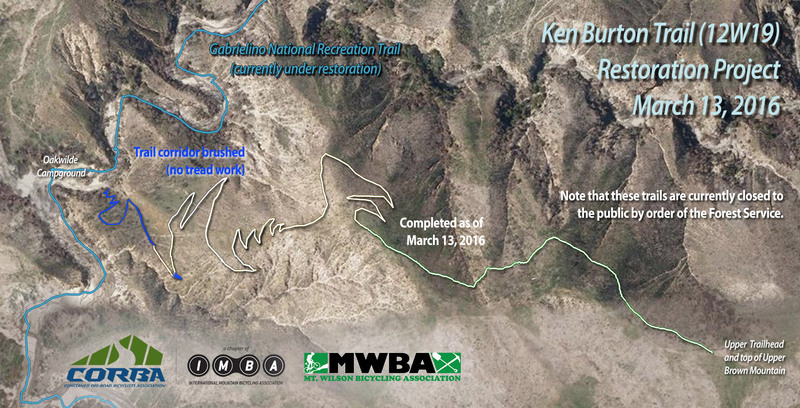 We currently estimate two to three more days working on the bottom of Ken Burton trail, and an additional day on the Gabrielino trail between Oakwilde/Ken Burton and Paul Little. We were also joined by an Ultra Distance runner, and past AC100 runner. Many trail runners are just as excited to get this trail opened as mountain bikers. During our last two days of work and long before we were finished brushing the corridor, we had hikers come up from the bottom, bushwhacking their way through until they heard us, then asking where the trail was. After reminding them the trail was closed to the public and we were working as Forest Service volunteers to rebuild it, he headed on beyond our work area for a leisurely stroll up the newly groomed segment of the trail, and all the way to Brown Mountain. People put far too much faith in outdated maps and information. After loading up tools, the group rode out via the Gabrielino trail back to the trailhead and our meeting spot. This section of the Gabrielino trail was worked on two years ago by Bellfree Contractors. volunteers, and the Los Angeles Conservation Corps with the financial support in the form of an REI grant to CORBA, and funding from the Forest Service for the project. While the section was rebuilt, it has been two years and it also once again needs some minor work. Between Oakwilde and Bear Canyon the trail is in poor condition and almost entirely gone and unrecognizable for a long stretch. Plans are underway to continue work on rebuilding that section of the Gabrielino, once again in partnership with the LACC, USFS, Bellfree Contractors and REI. Both the Gabrielino between Paul Little and Bear Canyon junction, and the Ken Burton trail, remain closed to the public by order of the Forest Service. Please respect the closure until the Forest Service opens the trails. We’re just as eager as everyone else to finish the project and be able to ride, but there are many steps to go through before that can happen, and it is the decision of the Forest Service as to when and if the trail will be opened. For all the volunteers who have joined us for at least two days, we’ve ordered a special commemorative T-shirts. It’s our–CORBA and MWBA– way of saying thank you. If you haven’t put in two days, there are a few more coming up starting this weekend and in April. 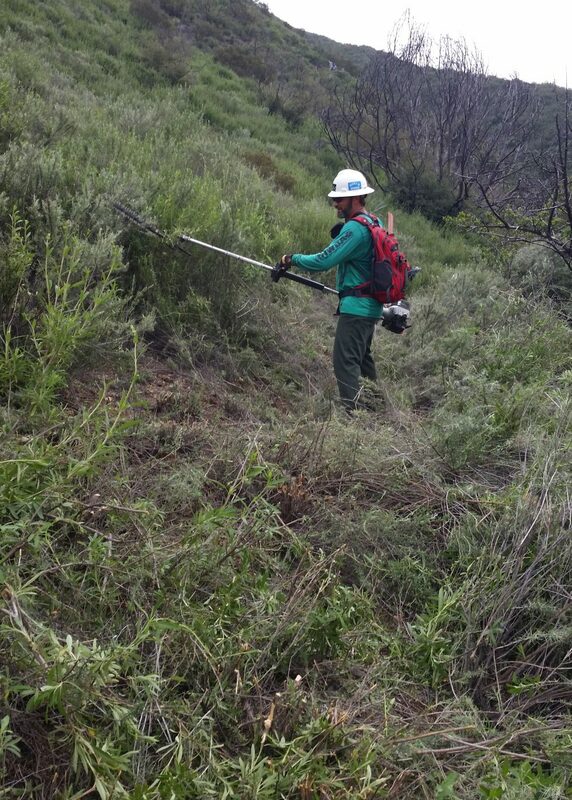 This entry was posted on Monday, March 14th, 2016 at 5:59 pm and is filed under Angeles National Forest, San Gabriel Mountains, Trail Building and Restoration, Trail Crew. You can follow any responses to this entry through the RSS 2.0 feed. You can leave a response, or trackback from your own site.